There’s no forgetting the wonderfully surnamed Miranda Priestly as Meryl Streep created her in “The Devil Wears Prada.” The character was said to have been modelled on Anna Wintour – the English editor-in-chief of American Vogue. But that’s beside the point – Streep was nominated for an Oscar, won a Golden Globe and a bucketload of other awards for the part. Remember the way Meryl’s Miranda waved her middle finger at people when, from behind her desk, she’d had enough of their trembling-kneed presence? And the way she said, “That’s all,” ever so softly? And the way she sent people running around the New York block for her morning coffee? And, when a prospective personal assistant made to respond to her observation, “… and you have no style,” Miranda looked at her coolly and said, “No, no. That wasn’t a question.” She never shouted. Nor raised her voice. And through all her no-holds-barred comments she quested for perfection, worked harder than anyone, and was outrageously, fabulously good at what she did. 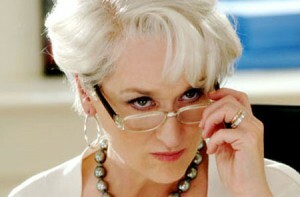 Meryl’s Miranda was magnificent. This entry was posted in News, On Writing: General, On Writing: Short Stories and tagged Linda Bruicesmith, Meryl Streep, Miranda Priestly, The Devil Wears Prada. Bookmark the permalink.